After breakfast we walk up towards Tizi n’Techt pass (2000m) via a juniper forest, enjoy the panoramic views over Mount Oukaimeden and the Berber villages of Tinitine and Tagadirt Ait Ali. Lunch on the pass and then continue to Azzadene valley. 6 - 7 hrs walk, overnight in a Berber house. After breakfast we walk up towards Tizi n´Mzik (2500m).The pass offers a beautiful view over the Imlil area. Lunch will be prepared halfway down to the Imlil valley. 4 - 5 hours of walking, overnight in a local Berber guesthouse. After breakfast, a walk through the Berber villages via the Sidi Chamharouch shrine (2500m) to reach the mountain hut. Here we will stop for a picnic lunch. We will continue towards the refuge (3200m). In the evening a traditional Moroccan meal will be prepared for dinner. During summer months there is an option to spend a night in the tent. The next day starts with an early wake up to escape from the full power of the sun. Breakfast is served around 5:00 am. We will begin the ascent climb at 5:30am. In the middle of our climb we will stop for a short break with some refreshments: water, oranges and nuts. After walking uphill for some 3-4 hours, we will be able to enjoy a picturesque view of all the High Atlas Mountains, valleys and Berber villages. When reaching the summit, we will have a break of 45 minutes to take pictures and enjoy the magnificent view. Afterwards we return back to the hut, where the lunch will be awaiting for us. To get back to Imlil we will follow the same route down the hill. From Imlil we will be taken back to Marrakech. We will cross the Tizi n’Tichka pass of the High Atlas. You will pass through many Berber villages, and once in the desert, riverside oases and barren hillsides are clustered with kasbahs. After lunch we will drive further to the Valley of Roses, with beautiful views of the Dades valley and the Valley of a Thousand Kasbahs. Overnight in Dades. After breakfast we will drive to Todra Gorge and after a short stop there we will drive to the dunes of Erg Chebbi. 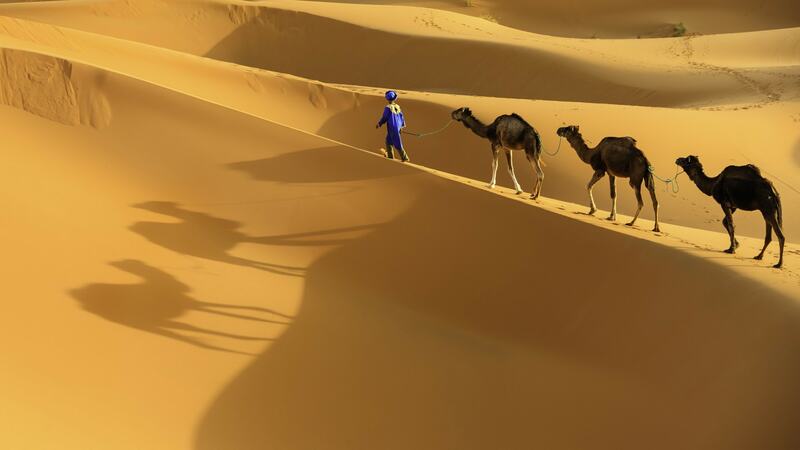 We will arrive there around 4:00 pm and after a short break you will ride camels into the dunes, where you will spend the night in Berber tents. After seeing a sunset you will enjoy a fantastic dinner. After viewing the sunrise and having breakfast at the campsite you will ride the camel’s back to the auberge. From there it will be a long day driving to Ait Benhaddou: a small town with one of the best-preserved and most sought-after Kasbah's to visit in all of Morocco. You will also visit one of the longest valleys in Morocco: the mighty Draa Valley. Drive back to Marrakech via Tichka pass. Early afternoon arrival in Marrakech. Overnight. Drive from Marrakech to Essaouira. 3 hours driving through the Argan forest. Overnight in a riad/hotel. You will be driven back to Marrakech. In the afternoon Marrakech sightseeing with a local guide.